Omega fatty acids have long been known to have significant impacts on reproduction in dairy cattle. 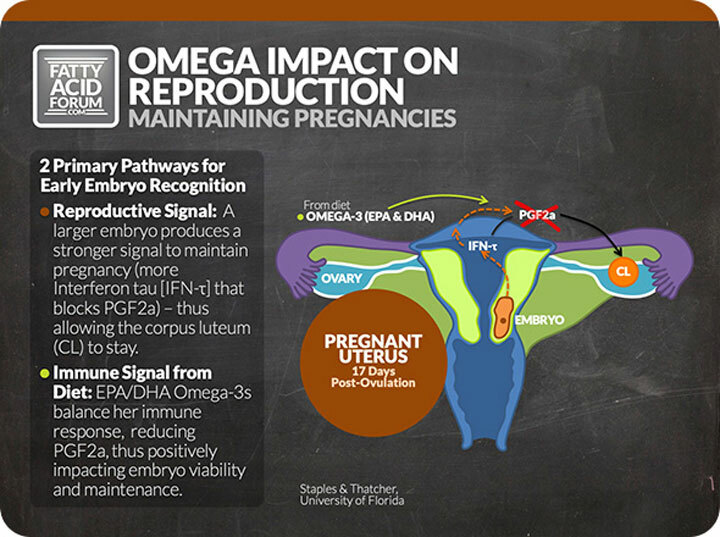 Specifically EPA and DHA omega-3‘s play a substantial role in improving the maintenance of pregnancy. Watch this Quick Guide to Fatty Acids as we review the primary pathways for early embryo recognition and the data supporting this important mode of action. The two primary pathways for early embryo recognition of pregnancy. The impact of feeding a lower inflammatory diet has on the release of prostaglandins in a pregnant uterus. Check out Dr. Charlie Staples series on Essential Fatty Acids from The Fatty Acid Forum! Thanks again for your interest in better balancing fatty acids in your dairy cow diets. As a reminder, this "Quick Guide" is meant to be just that - a quick and handy reference to better balancing fatty acids for improved immune balance and herd productivity. For a deeper dive on fatty acids, be sure to visit FattyAcidForum.com for free video courses on fatty acids, or go to OmegaBalancer.com where you can enter your TMR ingredients and assess your ration's current balance of omega fatty acids.